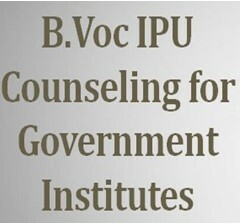 B.Voc IPU counselling registration process will started in September 2018 for admission in Bachelor of Vocational Studies (B.Voc) courses affiliated to GGSIPU. The Department of Training and Technical Education (DTTE) will conducting the offline counselling process for admission to B.Voc Programme for the Academic Session 2018-2019 in Nine Government Institutes of Technology. Candidates have to fill the application form to participate in B.Voc IPU Counseling 2018. Age- The age of candidates should be between 16 to 45 years. Candidates must have completed Class 12 from CBSE with English as a subject of study (core/elective/functional) in the qualifying examination. 10+2 year ITI in the relevant discipline. Candidates must have completed Class 12 from CBSE or equivalent with Physics, Chemistry and Mathematics as the subject. Provided the Candidate has passed in each subject separately. Candidate must have passed in English as a subject of study (core/elective/functional) in the qualifying examination. NSQF Level IV in the relevant discipline. Those candidates who want to participate in B.Voc IPU Counseling 2018 required to fill the application form. The B.Voc IPU Counseling application form can be filled through the offline mode only in September 2018 (Except Sundays and Gazetted holidays). Candidate should click on the following link to download the application form. STEP 1: General Details: Candidates have to fill their general details such as Name, Gender, DOB, etc. in the given section. STEP 2: Course Selection: Candidates have to choose their preferred course from the list. They may opt for multiple choices. STEP 3: Education Details: Candidates have to fill their educational details such as Highest Qualification, Name of Board/University, Passing Year, etc. STEP 4: Contact Information: Candidates have to mention their contact details such as address, phone number, etc. The filled application form has to be submitted through offline mode only along with the self-attested photocopy of 12th / 10 + ITI (2 Yrs) /3 Yrs Diploma/ NSQF Level IV Certificate and Reservation/ Category Certificate (if any) at the following address by due date till 5.00 PM. Copy of Application Form submitted in BPIBS. Bank Draft of Rs. 25,000 in favour of Registrar, Guru Gobind Singh Indraprastha University, payable at Delhi. The candidate will write his name, date of admission, phone, address, mobile no on the back of the Bank Draft.